With his father at a summit with North Korean dictator Kim Jong Un, Donald Trump Jr. was glued to Michael Cohen’s testimony before Congress Wednesday, firing off commentary in real time as the president’s former lawyer painted a damning picture of the man he worked for over a 12-year period. Cohen began his opening statement by highlighting numerous instances that contradicted the president’s own account of events under investigation by special counsel Robert Mueller. As Cohen read his statement, Trump Jr. mocked his father’s fixer. Cohen described how his relationship with Trump developed over the years. Trump Jr., and Republicans on the House Oversight Committee, sought to portray Cohen’s account as unreliable. Rep. Jim Jordan, R-Ohio, charged that Cohen was angry at Trump over not receiving a job in the White House. “That’s the point, isn’t it? You wanted to work in the White House, but you didn’t get brought to the dance,” Jordan continued. Trump Jr. seized on this exchange, claiming that it showed Cohen was again lying to Congress. Eric Trump, the president’s middle son, also piled on over Cohen’s claim that he never sought a job at the White House. By and large, however, Trump Jr. steered clear of the specific claims made by Cohen about his father. Instead he sought to attack the messenger. Trump Jr. and Republicans on the committee also took aim at Cohen’s lawyer, Clinton loyalist Lanny Davis. “This is the Michael Cohen hearing presented by Lanny Davis ... the Clintons’ best friend,” Jordan said at one point. Trump Jr. picked up and pulled on that thread. 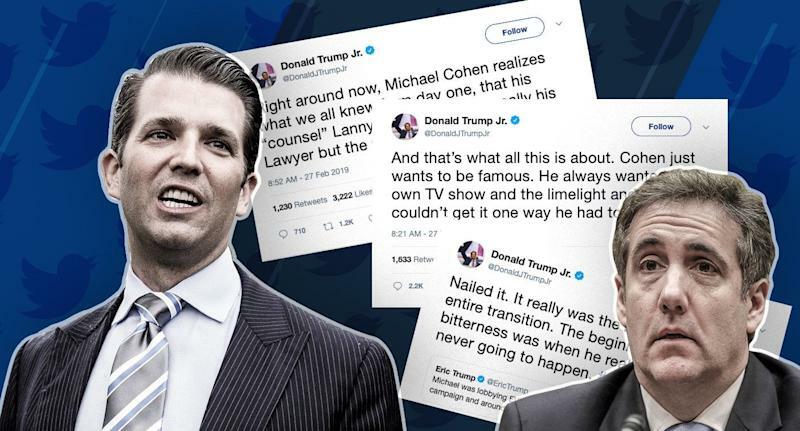 Trump Jr. also retweeted other observers, including journalist Garrett M. Graff, who asserted that Cohen had “no reason to lie.” Observers speculated that Trump Jr. hadn’t read to the end of the post. Incredible to see all the hubris drained from Cohen. I've been personally screamed at by Cohen on the phone before and know how much bravado he once had. This is a man with nothing left, with no reason to lie or obfuscate at all. Humbling, in its way. That apparent misfire was not lost on Graff, who took advantage of the occasion to taunt Trump Jr. about what Cohen testified about the president’s opinion of his eldest son.